Tent Review - 12 person Oztrail family size tent. This tent review looks at the quality, comfort level, and value for money of the 12 person family tent. If you are looking for quality and space for a large family or group, you've come to the right place. The Genesis 12P tent from Oztrail is designed to assemble quickly and easily with DuraPlus fiberglass poles, by only one person. J Hooks quickly attach to tent poles which makes the whole process childs play. It has a silver coated UVTex2000 polyester fly which protects from sun and rain, with 3 rooms at the back and one room at the front, making a total width of 4.9metres. It is one of the most spacious tents on offer. With a heavy duty PE bucket floor sewn high on the tent wall to protect you from ground water, the whole family will be comfortable in all weather conditions. Included are factory taped fly seams and storm flaps on all zippers for added security. This Oztrail 12 person tent boasts ultra fine insect proof mesh and has a great air flow due to the large doors and mesh panels. As expected with a quality Oztrail tent, there is a central mounting point for a hanging light, reinforced corner patches, storm flaps on all zippers, and is lightweight and able to be packed away into a compact carry bag. 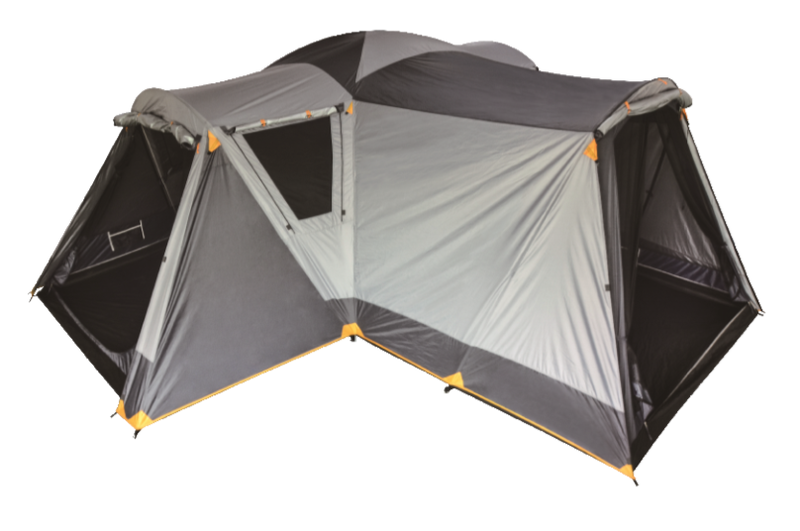 The Oztrail 12 person tent would be a valuable addition to any family's camping holiday. With a 12 month manufacturers warranty we have give it a 5 Star Rating.